Highly gregarious and ultra-cool, a squadron of Black Skimmers rests on a Florida sandbar. At ease, skimmers look like grounded F-14 fighter jets. When the pack takes to the air, they are transformed into a gracefully coordinated body of long-winged birds that commands one's eye. Moving in sinuous columns, the skimmers put on quite the airshow. When seen up close, a Black Skimmer takes on a comical appearance, what with the orange-based Bozo bill. They also look faintly thuggish; like an avian tough wearing a black hoodie pulled low over the eyes. Hold your thumb over the bill and temporarily block it from view, and the bird looks long, sleek, and ternlike. Expose the bill, and the skimmer takes on an undeniably odd and amusing look. It's as if its beak is deformed. But it isn't - the skimmer offers evidence of the miraculous possibilities wrought by fits and spurts of evolution; how forces of selection can shape such strange-looking features that are so beautifully functional. A Black Skimmer's normal working environment: inches off the water. This one appears to be scolding its reflection in a fishy backwater marsh. Agile and adept at close-quarter high-speed flight operations, skimmers swoosh low over the deck like barn-storming feathered crop dusters. And here's how they get the skimmer tag. Swooshing towards the water in a graceful descent, the Black Skimmer gently lowers that elongated lower mandible into the water and slices a long wake. Fish. In an amazing show of aeronautics, reaction time, and coordination, the skimmer sluices along, hoping to come into contact with a minnow or other small aquatic animal. When contact is made, it snaps that powerful thick bill shut in a nanosecond and secures a meal. If you are amongst the myriad birders that migrate south to Florida to gawk over some of the Sunshine State's specialty birds, you must thank snails. But all is not well in the world of these univalved gastropods, as we shall see. Windrows of apple snail shells litter the edge of a Florida marsh. I believe that all of these shells are of the introduced Island Apple Snail, Pomacea insularum. This invader, native to South America, has colonized much of peninsular Florida and can be locally abundant. High on any birder's Florida wish list is the spectacular and aptly named Snail Kite, Rostrhamus sociabilis. This female has an apple snail in her mandibles. Snail Kites have an incredibly long tip to the upper mandible of the bill, and their slender bill has evolved to harvest snails from their hard shells. But not just any snail - Florida Apple Snails, Pomacea paludosa. Unfortunately for the kite - and the snail - Florida's only native apple snail is under siege from at least three threats: outright destruction of wetland habitats; alteration of water regimes in existing wetlands; and the invasion of four other non-native species of apple snails. These invading snails displace the native apple snail, and it appears that young kites have a much tougher time extracting the meat from the larger and bulkier introduced species. If the kites, which feed almost exclusively on apple snails, can't make the jump to the non-native snails, their prospects in Florida do not appear good. Another wonderful Florida bird for U.S. birders is the Limpkin. What it lacks in plumage pizazz is more than made up for with earsplittingly loud piercing cries. Interestingly, this bird's range nearly mirrrors that of the Snail Kite, with Florida being the northernmost outpost. Like the kite, Limpkins are major snail consumers. As might be geussed from the size of their giant crowbar of a bill, Limpkins apparently can readily handle the enormous invader apple snails and seem to be thriving. I must have seen or heard a few hundred Limpkins in my short five days in Florida, including one favored spot where at least 65 were on display at once. At a secluded hardwood hammock deep in the Everglades, I was delighted to see a number of Florida Tree Snails, Liguus fasciatus. These often colorful arboreal snails have become rare, and are now listed as a species of special concern by the state of Florida. Showy and easily harvested, Florida Tree Snails are much sought by collectors, who have diminished or eliminated the snail's populations in some areas. There are eight described subspecies of Florida Tree Snail, and they come in a dazzling variety of color forms. This one was my favorite of those that I saw. Florida Tree Snails enter a period of aestivation, or dormancy, in December. They scale the trunks of smooth-barked trees, and once a favorable spot is found secure themselves tightly to the tree by forming an airtight, cementlike bond at the shell opening. As the snails often select eye-level resting locales they're easily noticed. At least 58 color varieties of Florida tree Snail have been noted, and some of them are incredibly showy; Gastropodian gems of dazzling ornateness. Greedy collectors have killed off some of these forms, and any Florida Tree Snail, whether it be a Plain Jane or rainbow of color, should be left unmolested. Cape Coral is a city of about 160,000 in Lee County, Florida, near the Gulf Coast. Apparently it is the 2nd largest Florida city by area, but it doesn't have a big city feel. It might be called the "Venice of the America's", as there are some 400 miles of canals - more than any other city on earth. But I wasn't here to seek gondolas - it was one of the most curious of feathered beasts that I sought. A seemingly innocuous side street in residential Cape Coral. But wait! What are those exclosures dotting the grassy sands? They're ropes strung to delineate active Burrowing Owl burrows! Here, a little fellow peeks from his lair. The wooden stake is there to provide a perch. It isn't hard to find Burrowing Owls in Cape Coral. Just troll the side streets and look for the short wooden crosses and/or roped off plots. When such a site is found, get out and look closely for the little owl. Big sudden movements may startle them and the owl will instantly duck out of site underground, but with a bit of patience one can walk right up to them. Burrowing Owls are diurnal - active in the day - and thus can be easy to observe. The Cape Coral birds, given their close proximity to people, have become quite tame. I was able to sidle to within ten feet of this bird, and it would scarcely even give me a glance. I can't even imagine how cool it would be to have these as "yard birds", and watch them court, hunt, and raise young at fingertip range. Note the long powerful legs and big feet. This is an owl adapted for a thoroughly terrestrial lifestyle. Those stiltlike legs also elevate the owl and give it a better view of its surroundings. While perfectly capable of excavating a burrow of their own, Burrowing Owls often utilize old armadillo holes or those of other digging animals. An estimated 1,000 pairs of Burrowing Owls dwell within Cape Coral's limits - the largest concentration of owls in the state. Like many other species of indigenous Florida wildlife, Burrowing Owls are under siege due to rampant, often poorly thought out development. This species is now listed as a species of "special concern" by the state, and a great many of their former haunts have been destroyed. Total Burrowing Owl estimates for Florida range from a high of 10,000 pairs to as few as 3,000. Cut the difference and figure there's maybe 6,500 pairs still tunneling in the landscape, and one quickly sees the significance of Cape Coral as a refugia for these tunneling hooters. Perhaps one-sixth of ALL of Florida's Burrowing Owls live here. To their credit, the city does work diligently to protect the owls, and promote their well-being. Developers are provided guidelines to work around nesting sites, and residents are encouraged to take steps to create better conditions for the owls. A group known as the Cape Coral Friends of Wildlife even sponsors a "Burrowing Owl Festival". If you are ever in the area, take some time and investigate the Burrowing Owls of Cape Coral. Their relationship with people in this city of canals is certainly one of the more interesting interactions of man and beast. Bill Thompson, Jr., back row, center, with his family. The world lost a great one when Bill passed on yesterday afternoon. It would take an abundance of superlatives to do Mr. Thompson justice. Everyone who ever encountered Bill came away feeling a little more important, a little better appreciated, and a little more liked. He was the kind of guy who always asked after others, was quick with a joke and a smile, and hid a mountain of talent behind a natural humility that had him more interested in you than talking about himself. Bill, along with his wife Elsa, began Bird Watcher's Digest on a shoestring back in 1978, and of course the publication is now the best known amongst many such mags. There wasn't anything like BWD in 1978, and it was a most definite gamble to launch a birding-heavy magazine back then. But it worked. I got to know Bill reasonably well over the last decade+, and it was always a high point to see him. The more I learned of him, the more impressed I became. When I found out he was a jazz pianist, it blew me away. He was hardly a guy to be pigeonholed, and Bill managed to do a lot of things in his long life, and do them well. My condolences go out to the entire Thompson family, and Bill will be missed by scores of friends. The Marietta Times ran a nice piece on Bill's life today; it follows. 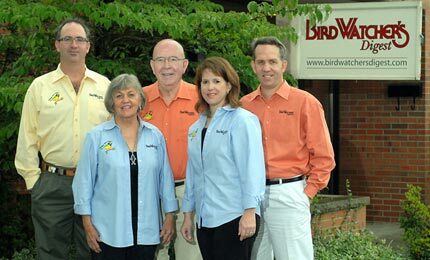 Bird Watcher's Digest co-founder and community leader Bill Thompson, Jr., died Tuesday afternoon. He was 78. Andy Thompson, state representative and Bird Watcher's Digest publisher, said his father had developed pneumonia and was admitted to Marietta Memorial Hospital Friday. He died around 2 p.m. Tuesday of complications related to the pneumonia. "My dad was a mentor to so many people in this community - he was a great role model," Andy Thompson said. Julie Zickefoose, Bill Thompson's daughter-in-law and a contributing editor to Bird Watcher's Digest, described him as "a very generous and creative spirit." "He loved and believed in Marietta like no one else," she said. "And he worked well into what would have been retirement age to make it better." Zickefoose noted her father-in-law has many legacies, including the magazine and his work in the community, but another important memory to her is his musical talent. "I think my favorite place to see him was behind the piano," she said. "He was an amazing jazz pianist, and he could take you places very few people can." Bob Kirkbride, a longtime friend and former co-worker, said the community will really miss Bill Thompson. "Bill and I worked together at Marietta College for about five years in the mid-1970s, although he was employed there much longer than I," he said. "He was vice president of development, and I was vice president for finance and administration. His job was to raise money, and mine was to save it." Kirkbride said Bill Thompson deserves a lot of recognition for what he was able to do during his years with the college. "Bill planted a lot of seeds with donors that the college continues to benefit from to this day," he said. Thompson and Kirkbride also began working with many others in 1991 to build up the Marietta Community Foundation, a philanthropic organization that supports a myriad of community and charitable endeavors. Bill Thompson served as the foundation's president and CEO from 2007 to 2010. "The foundation has now given more than $10 million to the community and also possesses an endowment of $10 million," Kirkbride said. "And Bill had an important part in that." Mark Schwendeman is chairman of the Marietta Community Foundation Board. "In his role as CEO and mine as board chairman, Bill and I had developed a great friendship," Schwendeman said. "Probably one of his biggest legacies will be the 20/20 Fund project," he said. "Bill and Elsa (Bill's wife) worked together in that to bring the hot lunch program back into Marietta schools. And the foundation's new Vision Project, just under way, will benefit the community for years to come." Marietta Mayor Michael Mullen had known Bill Thompson since the mayor was a teenager. "His son, Bill III, and I played music together more than 30 years ago," Mullen said. "Bill Jr. was a fine, fine, fellow -- always had a big smile and a hearty laugh. He made you feel so comfortable and was never superficial. You felt a one-to-one, genuine human connection when he was around. "This community will truly miss his spirit, and our condolences go out to his entire family," the mayor said. In addition to his wife and two sons, Bill Thompson Jr., is survived by a daughter, Laura (Thompson) Fulton. My friend Bernie Master happens to be down in Florida, and we met up this morning to go look for Florida's only endemic bird, the federally threatened Florida Scrub-Jay. Bernie took me up to Oscar Scherer State Park, and scoring the jays was a breeze. Picture-perfect scrub-jay habitat, a mixture of scrub oaks, saw palmetto, and scattered slash pines. Lots of other cool flora, too. It didn't take long before we heard the harsh scolds and querulous notes of a family unit of jays. Florida Scrub-Jays are ridiculously tame and extremely curious. This one investigates your blogger from the brush. Florida Scrub-Jays have declined alarmingly. Their historical range once covered about 7,000 square miles, and they were probably quite common in appropriate habitat. Rampant development in peninsular Florida has destroyed much dry scrub and the jay's total population may now be as few as 7,000 individuals. In 1995, the scrub-jay complex was split into three species: Western Scrub-Jay, Island Scrub-Jay (Santa Cruz Island, southern California), and this one. Thus, the Florida Scrub-Jay became the only resident bird completely confined to the Sunshine State. Many populations are heavily studied, as can be seen by the four colored bands on this jay's legs. Easily one of the tamest wild birds that you'll encounter in North America, Florida Scrub-Jays will often closely approach people. That was our experience, with jays coming within five feet of us without any coaxing whatsoever. Florida Scrub-Jays are highly social and form long-lasting family units. Young birds stay with the parents for at least a year, and serve as "helpers" for future nestings. At least seasonally, acorns from any of several species of scrub oaks form the bulk of the jays' diet. This is Myrtle Oak, Quercus myrtifolia, an elfin treelet of dry sandy soil. We saw some of the jays harvesting and pounding open these acorns, and sometimes transporting two at a time. This one - I think - is Sand Live Oak, Quercus geminata, another jay food source. These oaks and all of the other plants in these dry scrub communities are fire-dependent, and by extension, so are the jays. Fortunately, the staff of Oscar Scherer State Park and the Florida Department of Natural Resources manage for scrub-jay habitat. This is a newly cleared area that, in a few years, will provide suitable conditions for the jays. A Loggerhead Shrike peers curiously at your blogger. Your blogger is quite grateful that he is not a mouse or grasshopper, lest he be pounced upon and torn asunder. Shrikes are very common in this area (Naples) of Florida. One won't drive far without seeing one on a wire. They tend to be quite tame, and this individual allowed me to walk directly under him, snapping photos all the while. Shrikes are brutish songbirds, pouncing on about anything that they can overpower. 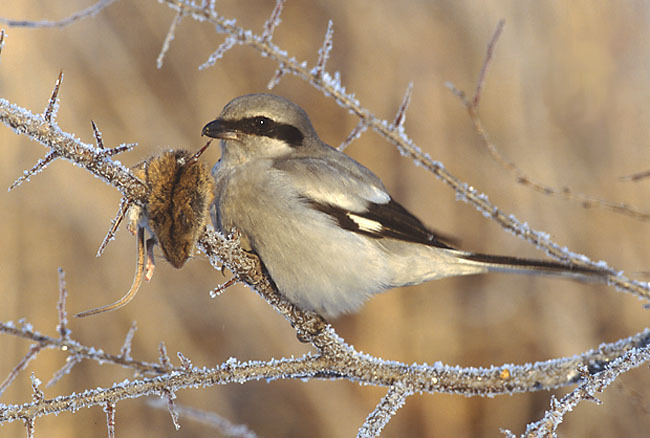 For graphic evidence of their ferocity, see THIS POST about a Northern Shrike. I have fled the icebox of Ohio, and I'm glad to be out there for a bit, I don't mind telling you. Made the drive down here to Estero - near Naples on the Gulf Coast - Friday and Saturday, and the Buckeye State was frigid when I left. My car's thermometer hit minus 2 several times in Ohio and it didn't get above freezing until southern Georgia. It was only 40 when I hit the Florida line and that's darn cold to the locals. Today only hit the low 60's but it was sunny and felt great to a tundra-boy such as myself. Anyway, spent the day all over the legendary Corkscrew Swamp, and a few other hotspots near Naples. Lots of great birds and other animals, as well as plenty of cool plants. Tomorrow is a trip into the Gulf to go shark-tagging and I'm sure that'll be a wild ride. Hopefully we'll get a few of the toothy flesh-rippers and if so, you'll see 'em here. Lots of other tours scheduled for the next week: Everglades, Fakahatchee Strand, excursions for specialties such as Florida Scrub Jay and Red-cockaded Woodpecker, and much more. Mark your calendars for Wednesday, March 9! Put in for a day off, if need be. You'll not want to miss the now legendary Wildlife Diversity Conference. This event began some 20 years ago, with perhaps a few dozen enthusiasts gathered in a back room somewhere. Since then, it has mushroomed into what is surely one of the biggest one-day natural history conferences, anywhere. Last year, nearly 1,000 people came together to hear experts deliver presentations on a wide range of subjects, and I'd bet that this year is bigger and better than ever. The Wildlife Diversity Conference is sponsored by the Ohio Division of Wildlife, and takes place in the fabulous and roomy Aladdin Shriner's Complex on the east side of Columbus. Access to the site is a snap - it's right off I-270, Columbus' outerbelt - and registration is a breeze. Just click RIGHT HERE. This is a face only a mother could love, and probably only a wrinkled, slimy and gelatinous mother. It's an Eastern Hellbender, a massive stream-dwelling salamander. They've become exceeedingly rare in Ohio and much of their range, and we'll learn much about them from veterinarian Barb Wolfe. Huge prehistoric-looking beasts with primitive rattling calls, Sandhill Cranes always excite observers. We're learning lots more about cranes in Ohio thanks to biologist Dave Sherman, and he'll share his info with us. Looks like a bit of a sourpuss, this pie-plate of a turtle. And they get WAY bigger, and surlier! Spiny Softshells - and their rarer brethren the Smooth Softshell - are extremely cool turtles. They may look ungainly in my hands, but stick them in water and they move with the gracefulness of a professional synchronized swimmer. Yep, there'll be a talk on these strange reptiles, too, courtesy of one of Ohio's most knowledgeable herpetologists, Jeff Davis. Northern Ravine Salamander showing off its sinuous, slinky shape. Lisle Gibbs of OSU will get into the fascinating world of genetics in our salamanders and snakes. There's more. Other talks will focus on wildlife-watching and the people that partake; ways we can interest others in birding and the out-of-doors; and protecting stream corridors and all of the benefits that come as a result. Couple all of this with the tremendous array of vendors and displays and the chance to fraternize with hundreds of other like-minded people, and you'll squeeze a lot of value from the day. Again, go RIGHT HERE to register, and I'll see you there! A majestic Tufted Puffin is the centerpiece of this shot. A miniscule but spunky Least Auklet is in the foreground, staring needles at your blogger, while a Black-legged Kittiwake incubates eggs in the background. If you're in the Columbus area, and would like to "virtually" visit St. Paul Island in the Bering Sea, feel free to come by the Grandview Heights Library at 1685 West 1st Avenue, Columbus, Ohio 43212 at 7:30 pm this Wednesday evening. I'm giving a talk about my experiences on this remote Bering Sea volcanic island for the Columbus Horticultural Society and guests are welcome. St. Paul Island is a bird-filled, fascinating place that is a four hour flight west of Anchorage. You almost CAN see Russia from there! Tall jagged cliffs support a fantastic array of breeding seabirds, and jumbo Northern Fur Seals wallow on the black sand beaches. Red-legged Kittiwake, one of the harder North American bird species to see, but not on St. Paul Island. Yesterday marked the sixth annual Ohio Ornithological Society winter raptor field day at the Wilds. Twas rather a balmy day by January standards in a wide-open 10,000 acre former strip mine in Muskingum County, Ohio. Here, my group basks in the nearly Floridian low 30's temperatures as they scan for Golden Eagles (we saw one, albeit at great distance). It never fails to amaze me how many people come out for this gig. We had 120 birders this year, and some years there have been 150. Of course, two years ago we did have some last minute cancellations and a few no-shows. It's possible that the minus 12 degree temperatures had something to do with folks begging out. A big thanks to Marc Nolls of the OOS and all of the expert birders who volunteer their time to organize this extravaganza and lead the field trips. Major props go to Nicole Cavendar of the Wilds and her staff for hosting us as they do every year. Not only does the Wilds open up and heat the normally shuttered restaurant for us to repair to at lunch time, this year they took everyone behind the scenes into the rhino and giraffe houses. Between the birds and mammals, this field trip sported quite a diversity of observations. There are lots of small rodents darting through the grasses at the Wilds, and their enemies are many. This is a female American Kestrel, and she was actively hunting a meadow right in front of our group. Whenever she'd spot suspicious movement, the kestrel would hover in place as if tethered to a string. We saw more kestrels than in recent years, and I am hopeful that the birds are claiming more of the nest boxes that were installed a few years ago. Another raptor noted for wind-kiting is the Arctic-breeding Rough-legged Hawk, and we saw many of the patchy light morph birds such as the one above. Fewer, at least for our group, were the ebony dark morph Rough-leggeds, one of the world's most striking raptors in my estimation. However, it was this distant speck that probably thrilled everyone more than any of the other feathered predators. Perched at treetop level, around 1:00 in the photo, is a Northern Shrike, one of the most violent songbirds to ever evolve. Northern Shrikes are not common birds in Ohio, and become downright rare south of the counties that buffer Lake Erie. However, this is at least the sixth year that one has been found in this location, and there was another in a distant corner of the Wilds yesterday. Classic shrike posture: perched horizontally, tail out, and eyes and head constantly awhir as it seeks victims. Once a shrike takes to the wing, watch out! They've got a very strong, fast flight and really cover the ground. Fast flurries of wingbeats are interspersed with pauses during which the bird starts to drop like a rock. Thus, their flight is quite undulating and woodpecker-like, or perhaps suggestive of a rabid oversized goldfinch on steroids and with a penchant for murder. Should you be a weaker animal, you'll do very well to stay out of sight of one of these beasts as we shall see. Classic edge habitat and the sort of country favored by shrikes. Open fields, shrubby successional areas, and interspersed stands of larger trees. And very importantly, plenty of suitable cache shrubs. Such as that bushy Autum-olive, left center, which will play into this story. Photo: Marek Szczepanek via Wikipedia Commons. Marek's excellent photo was taken in Poland. The Northern Shrike has a broad breeding distribution across the northern reaches of North America and Eurasia. Shrikes move southward as need be in winter to find food. We've got another, far scarcer shrike in Ohio - the Loggerhead Shrike. Loggerheads are far more southerly in distribution and experienced a boom and bust cycle in eastern and midwestern North America. Now that they've largely gone bust, only one or a few are found each year in Ohio. Anyway, this photo shows why a nickname of the shrike is "butcherbird". This shrike's hapless mouse victim has been firmly impaled on a thorn, and that's how these homicidal songbirds roll. Map courtesy Cornell Lab of Ornithology. Purple and brown denote the breeding distribution of Northern Shrike in North America. 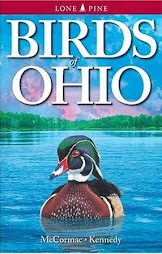 Our Ohio birds have certainly come a long way, and it'd be interesting to know where they come from. East or west of Hudson Bay? As shrikes can be long-lived for a songbird, it'd also be interesting to know if this Wilds bird or some of the others that show up at the same places each winter in Ohio are the same individuals. As word of the shrike spread among the eight groups that were out canvassing the Wilds, more people stopped by to admire the bird. One of the trip leaders, Jason Larson, observed the shrike rocket into an Autumn-olive shrub with a furry bundle. After the bird left, he sped over and discovered its somewhat grisly cache. Shrikes are well known for capturing and killing all that they can, which in the olden days of rampant anthropomorphism led to them being branded as wanton killers; evil scourges among otherwise delicate and golden-voiced songbirds. I'm sure that many a shrike has been offed by old-time naturalists incensed by the highly predatory habits of these feathered Vlad the Impalers. The reason that shrikes go on killing sprees is to stock the larder for lean times. Cold northern winters can be tough to survive, and if a tasty vole presents itself, the shrike would be foolish not to take advantage, even if it is still sated from the previous meal. So, the excess plunder is hung in dense shrubs where it less likely to be discovered by ground-roaming mammals. The shrike will return to the cache later and devour its victim. It must have been a sight, that shrike trundling through the air lugging this fat meadow vole. A plump vole can weigh about 50 grams; the shrike weighs but 65 grams. That's an extraordinary feat of strength! A shrike is certainly not an animal to be trifled with. They will attack nearly anything up to their size or even larger. There are reports of shrikes going after birds up to the size of Blue Jays and even Rock Pigeons. If the shrike gets the advantage, it'll snap the cervical vertebrae of its victim with a crushing pinch of its powerful bill. If that happens, its game over for the prey and that's a merciful thing considering how it'll later be dealt with. A common belief is that shrikes impale their victims because their feet are too weak to hold it, so the bird wedges the morsel between some twigs or hangs it on a thorn and then tears it asunder. I don't know about this. Any songbird that can carry a chubby meadow vole that nearly matches it in weight can't be that weak in the feet. It may be that the shrike's short legs and body dimensions just make it difficult to grasp the prey in its feet and simultaneously reach it with its bill. Once the victim has been secured, whether by thorn, barbed wire, or lodged between twigs, the shrike is free to use its raptorlike hooked bill to tear into the prey. While such manners may seem gruesome, the shrike has merely evolved a wonderfully efficient method of dealing with its food. Let's just be grateful that shrikes aren't the size of condors or we'd all be in trouble. Fred Case signs books at a 2009 conference. Case was a botanical icon, legendary for his accomplishments and command of many subjects, not just botany. All of his books were topnotch, but to me, the book "Trilliums" is a true standout. I had the good fortune of meeting Fred on a number of occasions, and one of those times was when he was down to the Ohio State University to lecture on trilliums. What a show that was! Fred used two screens, two slide projectors, and held a clicker in each hand. In a fascinating command of both projector and trilliums, he romped us around the North American continent visiting all of the members of one of his favorite plant groups. Never saw anything like that from a lecturer, before or since, and don't expect I ever will again. 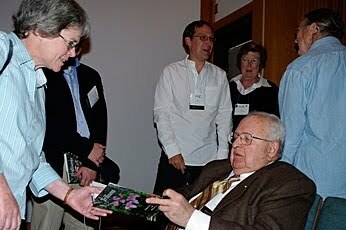 Fred Case was a true character and a huge bonus to the worlds of botany and education. He'll certainly be missed. Well known teacher and botanist passed away Wednesday, January 12, 2011. Age 83 years. The son of the late Julia Blanche (Coash) and Frederick W. Case Sr. was born February 16, 1927 in Saginaw, Michigan. He married Roberta Elizabeth (Boots) Burckhardt, February 14, 1953. She passed away June 8, 1998. He was a graduate of Arthur Hill High School and received his Bachelor of Science and Master’s in Education from the University of Michigan. He served with the U.S. Army during WWII. He returned to Arthur Hill High where he taught biology and natural science until his retirement. He was named their Honor Alumnus in 1978. He was named the Outstanding Biology Teacher in Michigan in 1971 and Outstanding Science Teacher in 1987. Fred and Roberta authored three books and authored or co-authored many articles for magazines and scientific publications about native orchids, trilliums, insectivorous plants, wildflowers and gardening. He received numerous awards and recognition for his achievements in botany and lectured extensively. He had been associated with Cranbrook Institute of Science, The University of Michigan Matthaei Botanical Gardens, Longwood Gardens, The Michigan Dept. 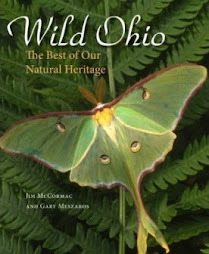 of Natural Resources Committee on Endangered and Threatened Plants, the Michigan Botanical Club, North American Rock Garden Society, the Saginaw Valley Audubon Society, Saginaw Valley Orchid Society, The Nature Conservancy, Michigan Nature Association, and many other horticultural groups. He enjoyed opera, theatre, reading, traveling, fine dining and Ketchup. Surviving are a son and daughter-in-law, David B. and Sheri Leaman Case; three granddaughters, Rebecca Case Myers and her husband Chris Myers; Emily Case and her fiancée, David Krueger, Caitlyn Case; a brother, a sister and two sisters-in-law, Win L. and Mary Case; Nancy Cota and Patricia Burckhardt; nine nieces, Julie Swieczkowski, Mary Lou Case, Susan Case, Kathy Case, Caroline Orsini, Amy Case, Jennifer Ashby, Amy Busch, Lisa Bulmer, two nephews, Stephen Cota, Bob Burckhardt; his lifelong friend, George L. Burrows IV; several grand nieces, grand nephews, cousins, other relatives, many dear and loyal friends. He was predeceased by two brothers-in-law, Andrew Cota and Carl Burckhardt and a niece, Debbie Kress. A special thank you to his caregiver, Hazel Irvin, for her assistance during his nearly two years of declining health. In a wonderful fit of irony, as I was composing my last post on the invasive grass Phragmites australis and its takeover of Mentor Marsh in the lower reaches of the Grand River, Randy Edwards wrote with exciting news from the upper reaches of the Grand River. Randy is the media relations manager for the Ohio Chapter of The Nature Conservancy (TNC), an organization that protects and conserves some of the best lands in the state. The Upper Grand River and vicinity is about as close to wilderness as you'll find in northeastern Ohio. 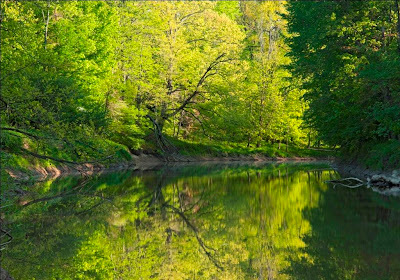 Not only is the stream one of Ohio's most pristine waterways, but terrestrial habitats along the river corridor are diverse, largely intact, and full of biodiversity including many rare species. This map depicts the jigsaw puzzle of protected lands along part of the Grand, with the centerpiece being the 1300-acre Morgan Swamp. Morgan is owned by TNC, and is a fantastically wild and swampy place that is a treasure trove of wetland diversity. The sinuous course of the Grand River is outlined in blue. 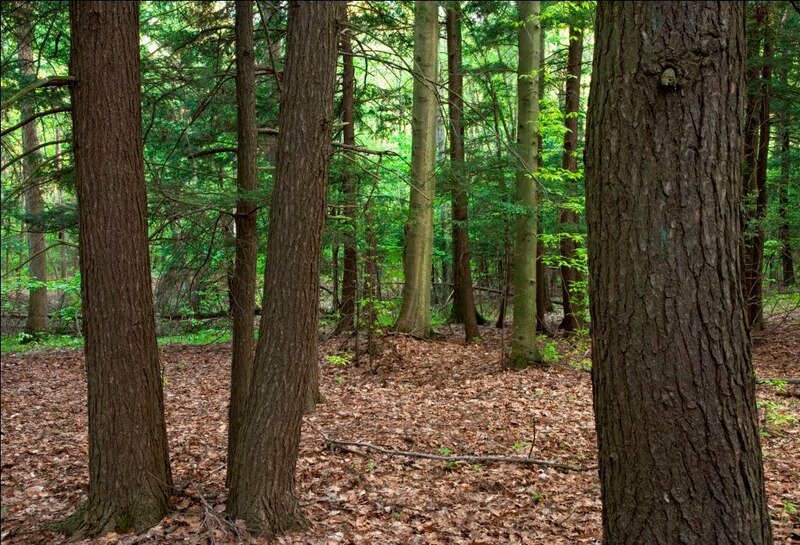 Land protection efforts began along the Grand in 1956, when the Ohio Division of Wildlife began acquisition for the Grand River Wildlife Area, which now totals nearly 7,500 acres. The Cleveland Museum of Natural History made its inaugural purchase in 1982 of an area now known as the Grand River Terraces. And, of course, TNC has added large and significant holdings to the total. 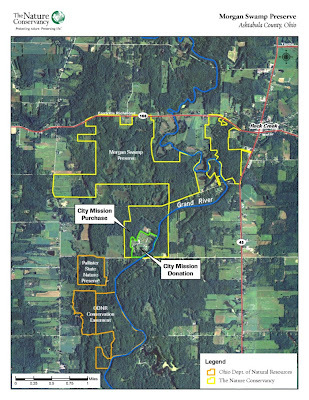 In 2009, the Ohio Chapter of TNC purchased a vital add-on to Morgan Swamp - 200 acres from City Mission, a Cleveland-based charity which owned a camp adjacent to the swamp. 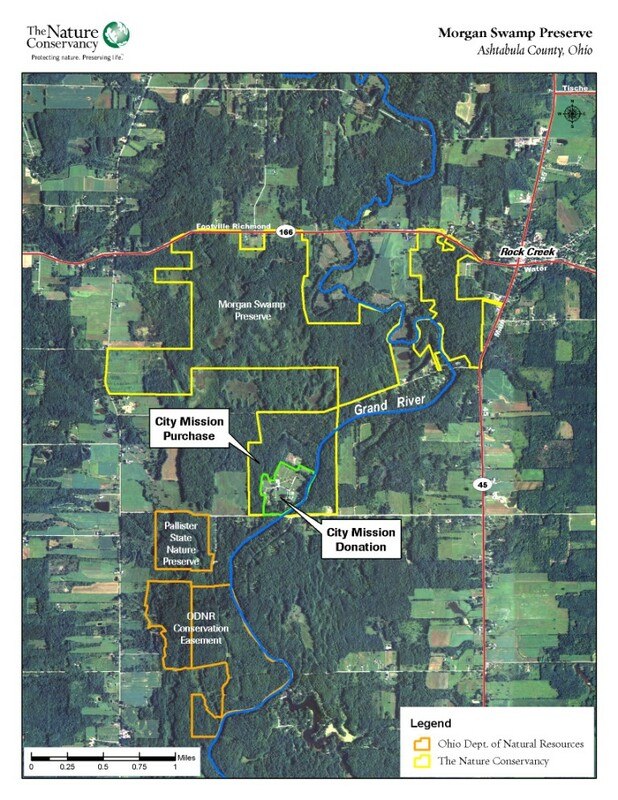 And now comes news that City Mission has donated the remaining 58 acres of the camp property to TNC, completing acquisition of critical streamside acreage in the Morgan Swamp region. This donation is a charitable gift of the highest order, and helps to ensure that Ohioans far into the future will have wildlands along the Grand River. The positive ramifications of protecting land along the Grand are numerous and varied, and I want to share a few of the area's highlights below. Many thanks to Ian Adams for the use of a few of his stunning photos. Ian is one of the country's best photographers of natural history; check him out RIGHT HERE. 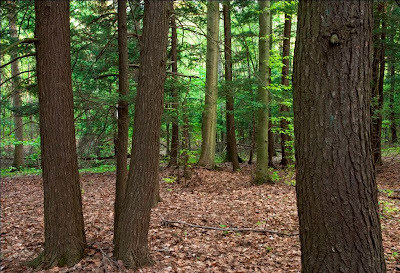 Morgan Swamp features one of Ohio's best hemlock swamps. Such habitat is exceedingly rare this far south, and supports many species of rare plants and animals. Boreal breeding birds such as Hermit Thrush and Winter Wren occur here, along with over 100 other nesting bird species. Scores of unusual plants occur in Morgan Swamp, including a half-dozen species of orchids. This is Crane-fly Orchid, Tipularia discolor. Its ghostly white spires of flowers push from the humus of the forest floor in mid-summer, when they are hard to see in the dimly lit understory. The flowers are noctodorous: they produce a fragrance only at night, which lures moth pollinators. 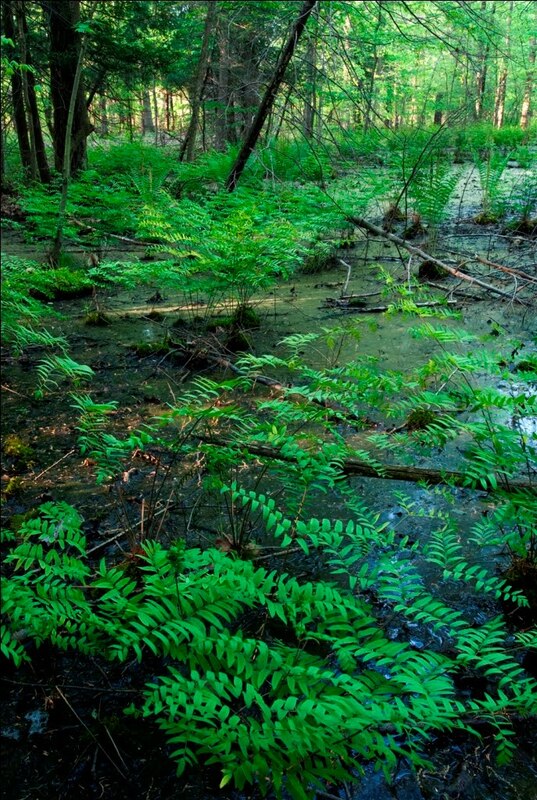 A soggy lowland is brightened by emerald Royal Ferns, Osmunda regalis. Ohio has lost over 90% of its pre-settlement wetlands, and conservation of our remaining bogs, fens, swamps, and marshes is vital. Biological diversity spikes enormously in such places, and their value is not just to the curious naturalist. Wetlands reduce downstream flooding, improve aquifers, provide breeding habitat for long-distance migrant Neoptropical birds, and harbor an incredible array of flora. Several species of salamanders breed in Morgan Swamp's wetlands, including Spotted Salamanders. The Spotted Salamander is one of a group known as "mole salamanders", as they spend nearly all of their lives subterraneously, tunneling through the soil. 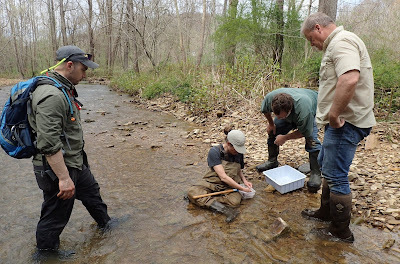 When triggered by the first warm rainy nights of spring, Spotted Salamanders and others of their ilk burst from the ground and engage in a fantastic overland migration to age-old woodland pools where they court, mate, and lay eggs. High on the flashy list of rare plants is the gaudy Turk's-cap Lily, Lilium superbum. It's worth a mid-summer trip to Ashtabula County and Morgan Swamp just to see this jaw-dropper. A vigorous Turk's-cap can tower well over your head and the plant's pendant pedicels might support a dozen of the fawn-speckled orange blooms. Central to all of the land protection efforts in this region is the Grand River. In recognition of the stream's outstanding attributes, it has been designated a State and National Wild and Scenic River. Permanently protecting riparian lands such as the newly donated City Mission property helps to protect water quality of streams. And ensuring the waters of the Grand River stay clean and healthy has consequences far beyond Ashtabula County and Ohio. 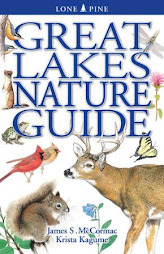 The Grand dumps its waters into Lake Erie, which is a world class perch and walleye fishery, and fishing alone generates tens of millions of dollars annually, and fish depend upon clean water. A number of highly sensitive organisms live within the waters of the Grand River, and this plant is certainly one of the oddest. 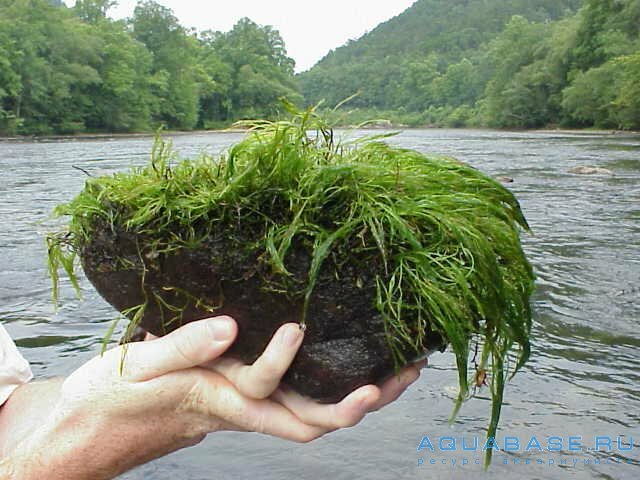 It is Riverweed, Podostemum ceratophyllum, and it is a true flowering vascular plant. By way of adhesive discs, the Riverweed attaches itself to rocks in swiftly flowing riffles, and grows under the water. 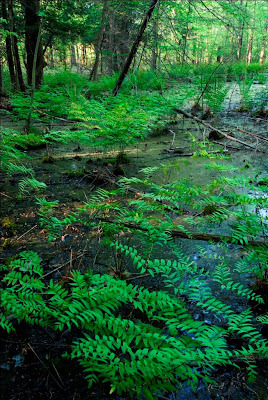 The Grand supports Ohio's only known population of Riverweed. This species has disappeared in many places due to water quality degradation. A staggering 74 species of fish have been found in the Grand River, including the little charmer above. 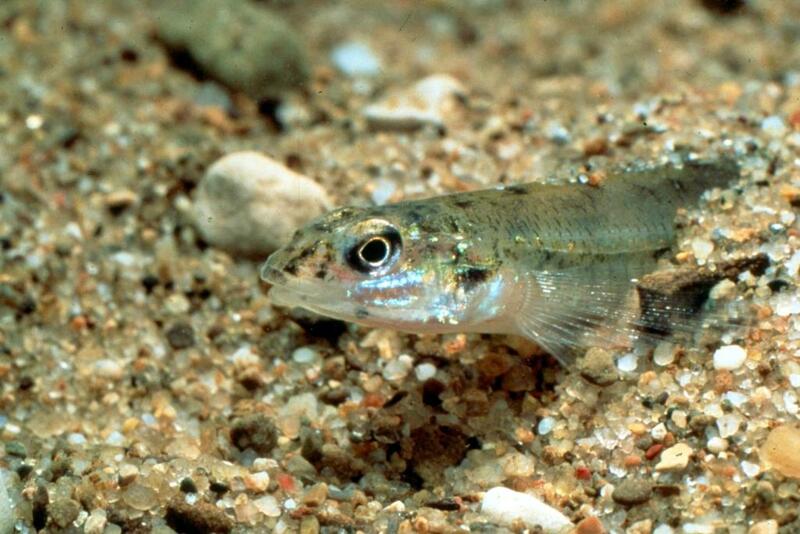 It's a Sand Darter, and these tiny bottom-dwelling fish are utterly dependent upon clean sandy stream bottoms. If excessive siltation enters the stream and smothers the sand with a layer of mud, it's curtains for the Sand Darter, and it has disappeared in many parts of its range. 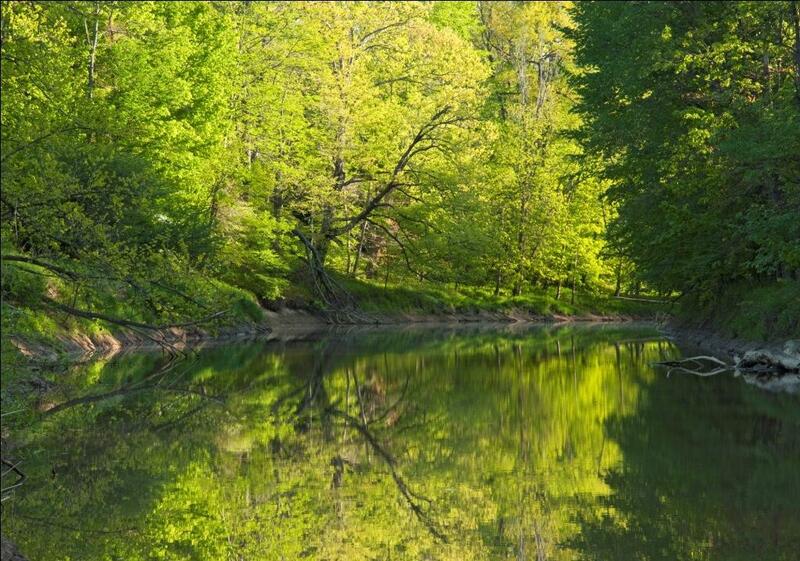 Without doubt, the Grand River and its corridor ranks near the top of Ohio's natural treasures. Major thanks are due the City Mission for helping to ensure that this resource is protected well into the future.